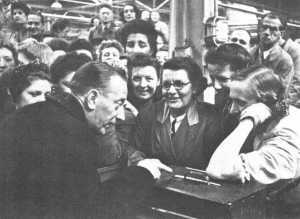 Wilfred Pickles pictured with a group of factory workers for a 1947 edition of Have a Go. 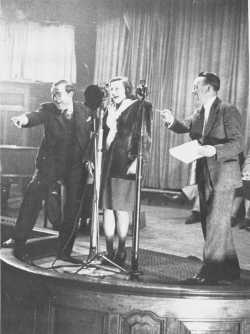 It was just after the war that it was suggested that Wilfred Pickles might like to compere a radio game - an unscripted programme which would involve the man-in-the-street. Have a Go was the title he himself suggested. 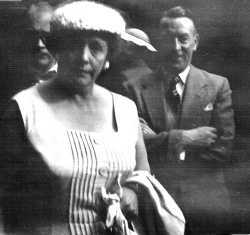 Wilfred and his wife Mabel, took the programme to church halls throughout the length and breadth of the land 'bringing the people to the people'. It was all good homely fun, as the picture above shows. 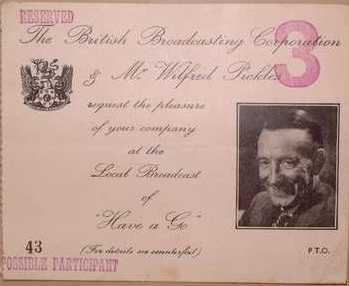 The programme was one of the most popular shows ever broadcast on either radio or television. At its peak in the 1950s, when it was produced by Stephen Williams, it was said to attract an audience of twenty million. People warmed to the show as a celebration of ordinary folk, who were encouraged to tell heart-warming stories and share the experiences of their early lives and families. Afterwards they were invited to answer quiz questions for money prizes. Hence the catchphrase, "Give 'em the money, Barney!" (a reference to the original producer, Barney Colehan). Another catchphrase of Wilfred's was "Are you courting?" to his younger contestants. Later Mabel took over 'at the table' and local products were often added to the cash prize. The original prize money was 1 pound 18/6, awarded in instalments of 2/6, 5/-, 10/- and 1 guinea. The contestants always got the money as it was, effectively, their fee for appearing! 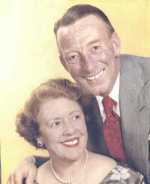 Jack Jordan was the original pianist, and composer of the theme tune, on the show, then Violet Carson (Ena Sharples in Coronation Street) was resident pianist until 1953, when Harry Hudson took over, followed in '66 by Eric James. To make yourself some dough. don't be shy and don't be slow. Come on Joe, have a go!" Have a go! Have a go!"